You’d think a trip to the Cotswolds in February would be in invitation for snow but the UK is having an alarming (global warming) heatwave this Feb so we actually had lovely weather! We decided to go as we’ve never been, we love a road trip and to celebrate our 12 year anniversary! A scenic drive back to London revealed this beauty in Dorchester upon Thames! So the Cotswolds totally lived up to it’s ‘chocolate box’ reputation with each village cuter than the last! We stayed in South Cerney which seemed to be a perfect example of an English village complete with village hall and cute river! Our expeditions began with Burford which is a picturesque single high st on a hill filled with shops to delight tourists including a brush shop! Lynwood & Co was a delight with delicious coffee and foodie snacks! Photographs of architectural and typographic things that caught my eye in the cotswolds! Next we trundled over to Dyrham Park as we wanted to catch a stately home while we were there; It was interesting for me, as to see the house you have to take a tour. Which I would normally avoid but it was super informative and felt like catching a glimpse into past lives of the super rich! The grounds also hold hundreds of deer that you can see trotting about in the distance! A Rummage through Oxfam Bookshops almost always pays off! 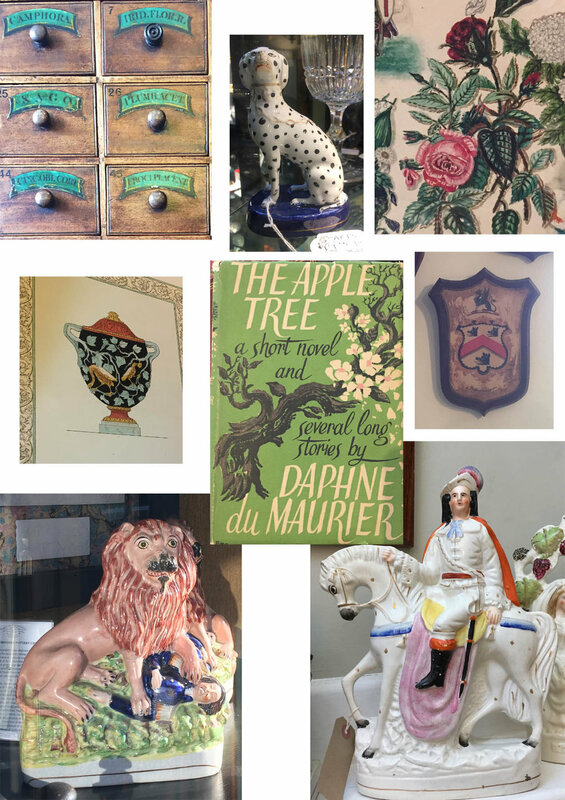 On our last full day we were determined to look around some antique shops so headed to Stow-on-the-Wold unfortunately like our experiences elsewhere in the Cotswolds Antique shops are more akin to museums and bare hefty price tags! But on the bright side that makes them all the more interesting to look around and there were a few amazing ones in Stow-on-the-Wold Including Baggott Antiques Luckily on our way back to London we passed through Wallingford where there is an Oxfam bookshop and I found this awesome Natural History book for a bargain price of £9 (Books are my weakness!) We also ate at The Old Post Office which was delicious! Antique shops in the Cotswolds are more akin to Museums! 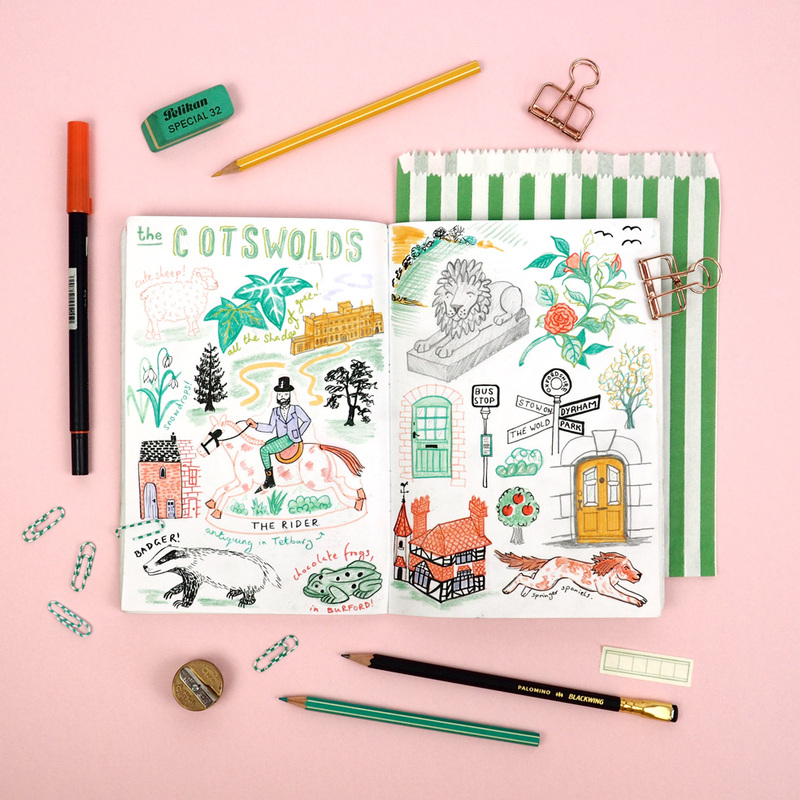 Here is my sketchbook spread documenting our time there; mainly my favourite buildings and antiques! All the Staffordshire Ceramics were definitely the most inspiring thing as well as the little architectural details like lions and gargoyles plus the cute doggos everywhere! Definitely up for more staycations in the UK!